While LTE investments have started to dwindle, 5G deployment have started to ramp up big time. According to a report published by Mobile Experts', China Mobile is expected to deploy at least 500,000 5G sites (1.5M RUs or higher) within the next two years. This international burst coupled with a shift in radio configuration for massive MIMO will permanently alter the face of the market. Mobile Experts have been tracking the macro Base Station market for 12 years now and have seen 10-15 million transceivers shipping each year. 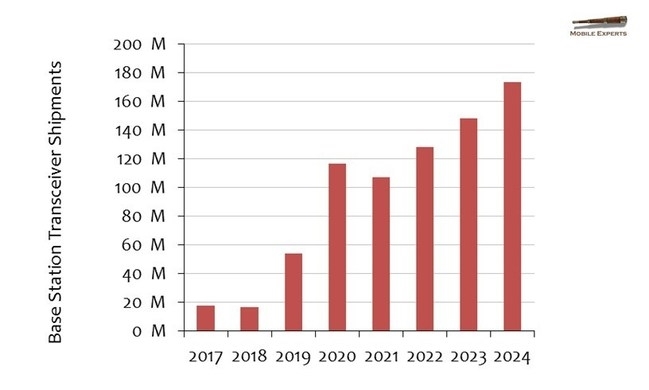 Upcoming changes in the 5G and massive MIMO market will push this number to over 100 million within the next year. The field deployment will begin within a few months, but the impact can already be seen by component companies. In the report, Mobile Experts explains the economic, ROI-driven decisions being made in countries like Korea, Japan, Finland, Dubai, China and the United States. Working closely with future 5G operators, Mobile Experts has compiled a report that offers a priceless peek in their telescope at what's on the horizon: the top 20 operators worldwide will be investing in 5G, with several different strategies based on economic conditions, level of competition, and the current level of traffic density. 5G is proven in trials with massive MIMO, real handsets, and both LTE and 5G core networks. The technical risk is now significantly reduced, and everyone's feeling confident that this works. All operators in key markets need to move to 5G in order to keep up with end-user demand. Most importantly, 5G is expected to bring new capacity to the mobile market with lower cost per GB than ever before. To find out more about this report, click here.